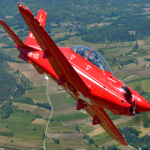 Pilatus Aircraft has received three contracts worth more than $294.6 million in total to supply PC-21 trainer jets to two international military customers and one defense company. The orders include 17 PC-21s for the French air force and two units each for Jordan’s air force and British contractor Qinetiq, Pilatus Aircraft said Wednesday. Oscar Schwenk, chairman of Pilatus’ board of directors, said France is the eighth air force to select PC-21 and the three orders will bring the total number of PC-21 aircraft operating worldwide to 209. France will use PC-21 aircraft to train future military pilots that will fly the Alpha Jet trainers before their conversion to the Dassault Rafale fifth-generation fighter aircraft, Pilatus added. The Swiss aircraft maker serves as a subcontractor under the French air force’s contract with Babcock Mission Critical Services France. Qinetiq operates the Wiltshire, England-based Empire Test Pilots’ School that will use PC-21s and modified flight instruments to train test pilots and flight test engineers. Jordan exercised an option to procure two more PC-21 aircraft under a previously awarded contract that initially required eight PC-21s. Pilatus is scheduled to begin delivery of PC-21 trainers to Jordan in mid-2017.